Emporio Armani isn't completely fresh to the world of smartwatches, after releasing a collection of hybrids last year. But with the Emporio Armani Connected and its full touchscreen face, this represents the Italian fashion house's first dip into the world of Android Wear. Just as you would expect, entry doesn't come cheap, either. We're still a long way away from Tag Heuer or Louis Vuitton territory, but with prices starting at $345 and higher end Connected models featuring a $395 price tag, it is among the most expensive to choose from in the large Fossil Group litter. 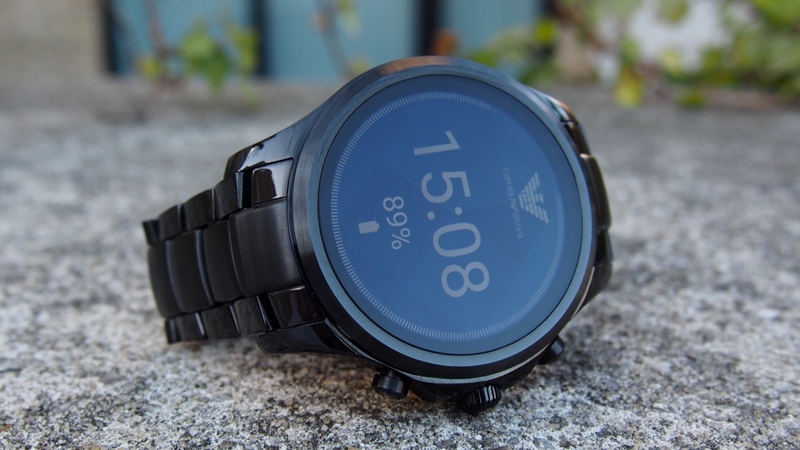 We've been spending the last few weeks with the Emporio Armani Connected to understand whether it offers a convincing touchscreen design, how it tweaks the smarts of Android Wear and if it can compete with the rest of the smartwatch field. Read on for our full verdict. Let's be honest, if you're looking to pick up this watch, you're almost definitely more focused on the design than its connected features. And in our opinion, this is one of the sleekest options to consider. Like the rest of this year's Fossil Group watches, there's no flat tyre here, just a full AMOLED touchscreen offering a display which is up there with the best — and certainly an improvement on the Fossil smartwatches we saw in 2016. Interestingly, though, Armani has chosen not to release the actual specs regarding its screen. What we do know is that this is a smudge magnet - especially with the metal band - and will have you pulling your shirt sleeve up to clean it much more so than devices like the Apple Watch Series 3. However, when pumped to the max, its screen resolution is strong enough to help you see in sunlight and beyond. There's been no skimping on build quality, either. While this admittedly feels like a more premium smartwatch thanks to our review model being the stainless steel band, the 46mm face doesn't feel bulky or cumbersome when on the wrist. If you want a lighter variant or simply a different colour metal, 11 options are out there in total, giving you a strong pack to choose from. What you do sacrifice with a steel band, of course, is comfort. We've nicked our wrist more than a few times with the Connected, and whenever we've moved back to the likes of Fitbit Ionic for running or strength training, the disparity in weight and wearability has been very noticeable. In terms of navigation, you have two buttons on the right side of the face which act as shortcuts to apps such as the Google Play Store, while the Emporio Armani accented crown plays an integral role in your movement. A long press will activate Google Assistant, while rotating the crown allows you to scroll throughout the menu screen and various apps. It isn't perfect — the crown itself is a little small and can sometimes be stiff to move if you haven't got a good angle — but it's a nice way to avoid filling the sharp screen with fingerprint marks. This is an attractive design that, while perhaps slightly bulky for some smaller wrists, can easily blend into formal wear, as well as the rest of your wardrobe. This is the most important aspect of the watch and Emporio Armani nails it — simple but still extremely stylish. Naturally, with Fossil Group's bevy of brands more aligned to fashion than tech, you'd expect the internal smarts to take a backseat here. And they do. Emporio Armani and Fossil have shied away from releasing all the tech spec but we found the Qualcomm Snapdragon 2100 processor to provide a zippy experience around the Connected. Delay when opening apps is minimal and menus almost never suffer from lag. Fitness enthusiasts will be disappointed, though, if they're looking to branch out to a more stylish all-in-one, with no support for heart rate tracking, no GPS sensor and zero opportunity for swimming due to the IP67 water rating. When we have taken the Connected out on a token run, the metal band was (obviously) seriously uncomfortable in comparison to the Fitbit Ionic and Apple Watch, so those who are looking to take the device out with their smartphone should at least invest in one of the more sporty bands to switch out. What was a nice touch, though, was the ability to control our music while on the go - whether playing through Apple Music on an iPhone or Spotify on an Android device. And while these more fitness focused features aren't exactly a stain on the Connected's name, since this isn't the device's focus, the lack of Android Pay is a bizarre omission. If Fossil left out the tech-y features in order to portray the image of a more everyday watch, it also needed to make something like NFC present across the board and boost the smart profile of its devices. The lack of LTE connectivity is similar. While this is much less egregious, in our view, it would have given the Emporio Armani Connected a serious case to rival bigger players in the market. Calls do come through the watch with a jingle and vibration, but you'll have to take it on your phone despite the presence of a microphone and speaker. The same, of course, goes for texts and third-party notifications like WhatsApp. The introduction of Android Wear 2.0 also brought with it the promise of micro-apps within the Fossil clubhouse — apps that are unique to each brand's range and offer some personalisation to separate themselves. While the Diesel On Full Guard provides the T-ON-I companion and the Michael Kors Grayson bringing a new watch face mode, My Social, the Emporio Armani option doesn't customise the power of Wear to the same extent, disappointingly. Instead, you're left with simply the Saved Faces micro-app, which allows you to essentially have quick access to faces you've customised. This isn't to say it isn't a nice entry, and it's actually encouraged us to mix up different background colours and routinely switch between them, but it feels like a missed opportunity. As for notifications, this is the standard experience you will find on Android Wear 2.0. It's still about swiping up to access the stream, then either right or left swipes to clear, with no real grouping. The Google Play Store is easily accessible, and, providing you don't mind speaking to your watch, fairly clear to navigate. It's not at its best when in more noisy environments, but that's to be expected. Raise to wake has been a little temperamental in our experience, too, but thanks to the always-on option being available, the time is never too far out of reach. As you'll have gathered, the features cupboard of the EA Connected is a little bare. However, while there are a few omissions, what it does bring to the table it manages to pull off convincingly. As always, battery life all depends on how you're using the device. If you're rocking an always-on display and have Google Play Music feeding tunes into your Bluetooth headphones, you're inevitably going to see your percentage run down quicker. However, with general use, we've found the Emporio Armani lasts for at least a day. If you don't charge the watch overnight, though, you're likely to struggle getting it over the line on that second day. This isn't too different from what we've come to expect from newer Wear watches, and though the Fitbit Ionic is offering leading battery life, around two days of life from a full-screen smartwatch is the standard. As for charging, you'll be given a lead with a magnetic puck on the end, much akin to Apple's offering. We've experienced no problems with the magnet staying in place overnight, and find it a much more preferable solution to the plug-in styles from other companies. There's no doubting the Emporio Armani Connected is one of the more stylish Android Wear smartwatches we've come across. While it shines in the design department, though, it doesn't offer much when it comes to features beyond the basics. Android Pay would be a natural addition to this package, and the lack of micro-apps result in this maxing out as a base-level experience. So a richer Wear experience exists elsewhere but we've no doubt the Connected's looks alone will help it sell and sell.